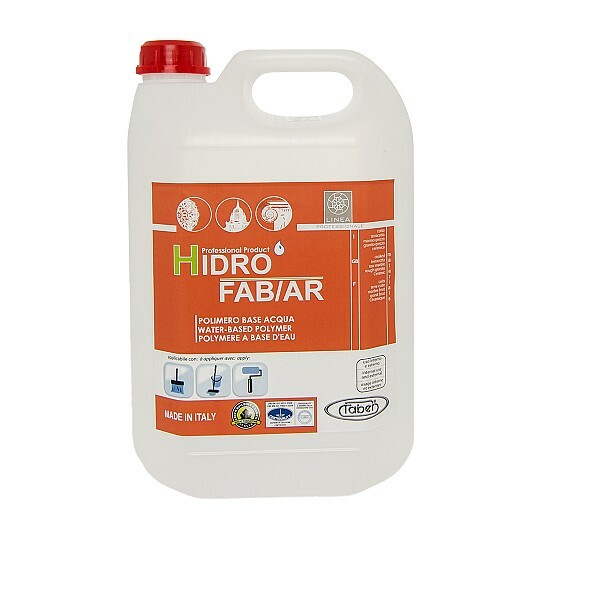 HIDROFAB AR is a water-based wax-resin emulsion to use as a self-polishing, finishing treatment for floors in natural stone, cotto, concrete and porcelain stoneware, natural wood or parquet and textured ceramic tiles. The product seals the textured surface, creating a dirt-proof layer and making daily cleaning and maintenance operations on the floor much easier. Treatment with HIDROFAB AR leaves the surface with a satin finish and it slightly enhances the original colour tone of the material. The protective layer created by HIDROFAB AR also stands out for its excellent water- and oil-repellent characteristics, to protect the surface against the formation of stains. HIDROFAB AR is particularly recommended for use on natural stone with a distressed, brushed or fine sanded finish and can also be used for excellent results on concrete, cementina and cement agglomerates, cotto, terracotta and porous surfaces in general. Thanks to the special formula, the product can also be used on compact, non-absorbent surfaces with a textured surfaces, such as textured or micro rough porcelain stoneware.